Hidden news about our weather in July: experts tell us what even well-informed people do not know. Summary: One of the great oddities of the 21st C America is our allergy to data about vital issues while being buried in “news”. For example, we invaded Iraq and Afghanistan with little care or information about what we’d face. The public fears al Qaeda while knowing little about its actual nature and capabilities. As for climate, perhaps the largest threat we face, the people most concerned often know the least about it. Carefully fed a narrative, they often reject information from the IPCC and major agencies that contradict the alarmist story. Yet effective public policy requires broader understanding by the public than a simple black-white story — in a democracy, at least. These posts sketch out aspects of climate science that we’ve been told about, but too few have heard. Today we look at our current weather. Status report: what do the satellites tell us about global warming? Who produces this data & analysis? To the right is a typical over-the-top image to arouse fear, about a world for a world roughly one °F warmer than the 30-year average. Excerpt from the August 2013 issue of the Browning Newsletter, posted with their generous permission. See section 5 to learn about it. Over the past 20 years, particularly since 2006, two long-term ocean cycle have changed their phases. This article will concentrate on North American but Europe and Asia are also heavily affected. 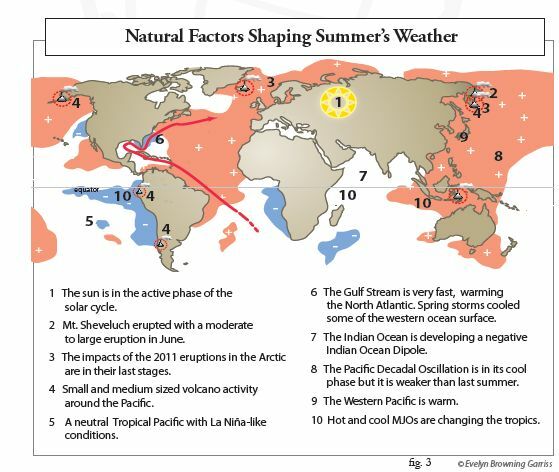 The Atlantic Multidecadal Oscillation (AMO) — As noted in the previous article, the AMO has made summers hotter and spring, winters and falls stormier in the Eastern and Central US. It also appears to be making Canadian winters milder and warmer. This phase began in 1995 and will continue another 15 – 20 years. The Pacific Decadal Oscillation (PDO) — This 50 – 60 year cycle shifts warmer waters from the eastern and tropical waters toward the western and polar Pacific. The PDO began shifting toward the negative phase in late 1999 and tipped in 2006. In general, it makes the western and interior lands of the Americas drier, including reducing snowmelt for the headwaters of major rivers such as the Colorado, Missouri and Amazon. From time to time, this trend will be interrupted by warm El Niños but will last another 20 years. It has been 14 years since the new climate normal began to form and seven since it became the dominant trend shaping North American climate. We are starting to see the impacts. The policy reformation has come in stages. In 1968 the National Park Service renounced its so-called 10 a.m. policy (put all fires out by tomorrow morning) that sought to promote quick forest restoration. The US Forest Service did the same in 1978. A common federal policy was adopted in 1995. This is not just a Western problem. The cold PDO magnifies the impact of cool La Niñas. This, combined with the warm phase of the AMO, has made drought more common in the South and Midwest. These lands have carefully attempted to encourage the regrowth of the heavily lumbered Eastern woodlands. 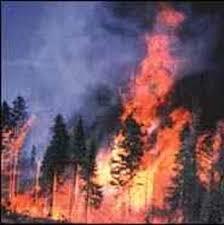 Wild fires, if not megafires, have become more common in these areas as well. There is no scientific literature that ties the lower Great Lakes levels to the negative PDO, but the two correlate historically. If the negative PDO is a large factor in reducing water levels, then these lower levels will continue another 20 years. The economic impact of these falling levels is hard to overstate. The lower levels pose economic threats to numerous industries that rely on the lakes water supply, including, shipping, electric, especially hydroelectric, power generation, tourism and recreational boating. The “New Normal” with a warm Atlantic and a Pacific that tends to be cool (interrupted by El Niños) is changing US temperature and precipitation patterns. This in turn, has had a major impact on sectors of the US economy. Agriculture and the energy segment are aware of these weather impacts. However, other sectors, from insurance, to real estate to transportation are also feeling the direct impact. Others will see an indirect impact. 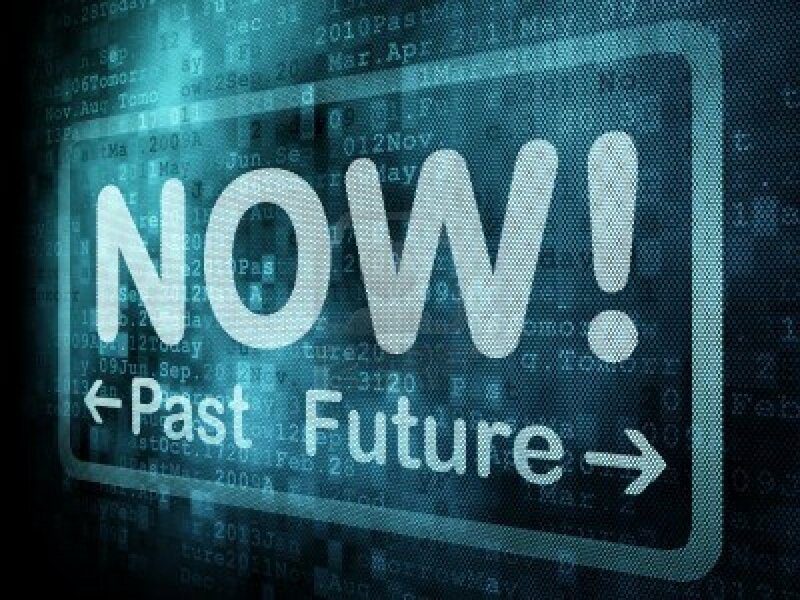 Remember, companies doing long-term planning often use records that are only 25 to 30 years in duration. The PDO tipped only 7 years ago. Most of the records that are used by policy-makers are biased towards times when the PDO was wetter than it is today. This has resulted in mistaken ideas of how rare a weather event may be. We saw what a potential disaster this 25-30 year approach could be when NOAA storm concerns were brushed aside by New York and New Jersey because there had been no landfalls since the 1950s. We are dealing with the same Atlantic and Pacific configurations that shaped the 1950s. Our economy and society will have to learn to cope with this New Normal. (2) Status report: what do the satellites tell us about global warming in July 2013? Global composite temperature in July: +0.17°C (0.3°F) above the average for July during 1981-2010. Anomalies are computed vs a 30 year base period. The World Meteorological Organization (WMO) recommends using the latest decade for the 30-year average. Roy Spencer (principal scientists on the team) shows another perspective on this data (at his website). 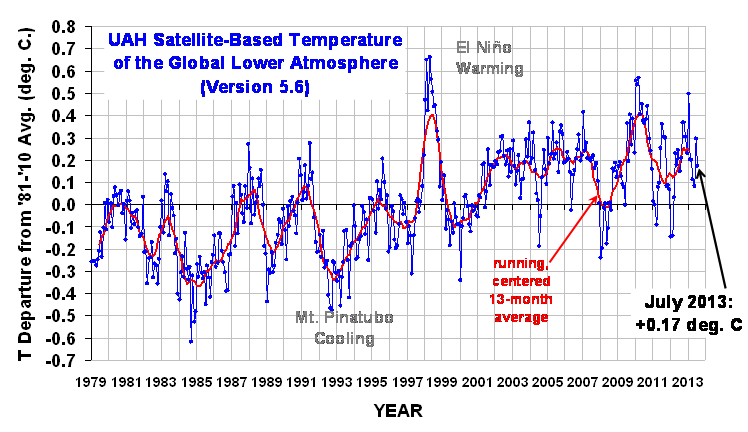 Wide swings in temperature; relatively flat trend since 1998. For more about the pause see summaries of the growing body research about it here, and the IPCC’s view here. 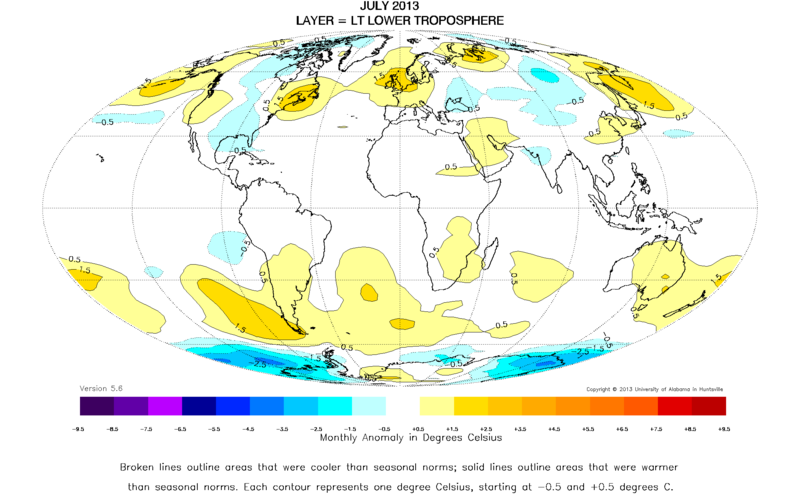 Compared to seasonal norms, during July the coldest area on the globe was off the coast of East Antarctica near the Ross Sea, where the average temperature was as much as 3.89°C (about 6.99°F) cooler than the Antarctic’s winter seasonal norms. Compared to seasonal norms, the “warmest” area on the globe in July was off the coast of Chile in the South Pacific Ocean, where temperatures were as much as 2.31°C (about 4.16°F) warmer than seasonal norms. Before we start, let’s put these numbers in a historical context, from page 10 of “The Recent Pause in Global Warming” published by the UK Met Office in July. Anthropogenic factors became the largest (not the only) driver since roughly 1950. (4) Who produces this data and analysis? (a) About the Browning Newsletter — One of the most acclaimed and accurate climate newsletters in the world. For over 35 years, The Browning Newsletter has been simply the best, most accurate source for long-term climate forecasts. Our subscribers include a diverse group of people and institutions interested in profiting from opportunities presented by changing climate, and those looking to protect their interests that might be affected by changing climate. They include farmers and ranchers, commodities brokers, large banks and financial institutions, hedge funds, agricultural supply vendors, and people interested in our global climate. As part of an ongoing joint project between The University of Alabama in Huntsville, NOAA and NASA, John Christy (professor of atmospheric science and director of the Earth System Science Center (ESSC) at U AL-Huntsville) and Dr. Roy Spencer (an ESSC principal scientist) use data gathered by advanced microwave sounding units on NOAA and NASA satellites to get accurate temperature readings for almost all regions of the Earth. This includes remote desert, ocean and rain forest areas where reliable climate data are not otherwise available. The satellite-based instruments measure the temperature of the atmosphere from the surface up to an altitude of about 8,000 above sea level. Q. What exactly do we mean by Surface Air Temperature? A. I doubt that there is a general agreement how to answer this question. Even at the same location, the temperature near the ground may be very different from the temperature 5 ft above the ground and different again from 10 ft or 50 ft above the ground. Particularly in the presence of vegetation (say in a rain forest), the temperature above the vegetation may be very different from the temperature below the top of the vegetation. A reasonable suggestion might be to use the average temperature of the first 50 ft of air either above ground or above the top of the vegetation. To measure SAT we have to agree on what it is and, as far as I know, no such standard has been suggested or generally adopted. Even if the 50 ft standard were adopted, I cannot imagine that a weather station would build a 50 ft stack of thermometers to be able to find the true SAT at its location. Q. What do we mean by daily mean SAT ? A. Again, there is no universally accepted correct answer. Should we note the temperature every 6 hours and report the mean, should we do it every 2 hours, hourly, have a machine record it every second, or simply take the average of the highest and lowest temperature of the day ? On some days the various methods may lead to drastically different results. Next Post The government strikes again, but finds yet another American willing to fight. Applause is not enough! I appreciate your adult commentary on the weather. I was wondering whether you had a link (or could post) about what was happening in the Canadian Arctic – in particular, in the western part of Nunavut on the Canadian mainland that is experiencing warm temperatures, for example, 25+ deg. C. @ Baker Lake. As for your suggestion to write about the weather in western Nunavul, it would be helpful if you provide some relevant background to your request. (1) Why tell about Nunavul’s weather? It seems too small-scale to tell a general audience anything of interest. Except perhaps as instruction about weather dynamics, which is outside the FM website’s area of interest. (2) Who writes about Nunavul weather? * links so readers can obtain additional information. Finding and preparing this material takes a lot of time. Why should we research current weather in western Nunavul? As opposed, for example, to the north polar region (above 80 degrees N), which has had unusually cold weather this summer (see the Danish Met Institute website) — and has significant effect on global climate. There are some articles on the FM website about the North American arctic. (1) About Alaska. These respond to articles in the US news media about Alaska which contradict peer-reviewed research — hence of interest. This post does discuss the Canadian arctic; posted for the same reason as #1. I apologize that I dropped our earlier conversation on your choice of sources for climate information. Once one lets things lie for a week or so in a comment section it seems pointless to jump back in. But I did want to respond, and this post seems like a good opportunity, since you have once again relied on one of the sources from a particular small faction of climate scientists. I do recognize that if you add up all your citations to various sources, you have, for example, mentioned Mann more than Spencer. But the tone of your commentary is plainly supportive of the views of Spencer and his “faction.” I have already given you several examples of such scientists making statements that are contrary to the main conclusions of the IPCC, as you asked for. Here’s a real doozy, though. Do you think that signing such a statement is indicative of trustworthiness as a source of information on climate change? (1) I totally reject your attempt to rule out people based on their personal beliefs, as have the overwhelming number of scientists during the past several centuries. It’s just an attempt to surpress views you don’t like — much like you previous “make stuff up” about content here (about which I do not see an apology for your incorrect smear). People are entitled to their personal beliefs — including their personal faith, their politics, their ideologies and philosophies — to be separate from their professional writings. This has been a standard defended for a long time against people like yourself who wish to create orthodoxies that rule out dissent. The personal beliefs of famous scientists — people making massive contributions to our civilization — often range from strange to stranger. So long as their professional work (ie, contributions to peer-reviewed literature, conference presentations, etc) does not cite these, it is none of your business. In my opinion you can line up with the others using such tactics: the Catholic Church’s inquisition, the Commies’ show trials, McCarthy’s witch hunts, and even the jihad by scientists against Macmillian for publishing Velikovsky’s nonsense. None of it worked; all are considered despicable today. (2) As for your comment about this post, it’s just more of the same. I cited a highly-regarded professional forecasting service — subscribed to by people wagering millions of dollars on short-term weather movements. Your comment about Browning Newsletter is just another ignorant smear. The second source cited here is the monthly report of a University of AL-affiliated unit to NASA. Your comment about them is just another ignorant smear. You can lie and insult to your heart’s content. Science will move on, and people will learn about what scientists say despite the efforts of your and and others like you. First, those “conclusions of the IPCC” are clearly stated as probabilities — not certainties. The IPCC discusses science, not religion. Second, as such there is nothing unprofessional about scientists disagreeing with the statements of IPCC reports. The IPCC itself cites hundreds of papers in the peer-reviewed literature disagreeing with their conclusions. History shows countless examples of consensus beliefs — often wide and deep (not all “consensus” are equivalent) that have proven wrong. I suggest you read a bit about the process of science. I recommend The structure of scientific revolutions by Thomas Kuhn (for decades the most-often cited work of social science), describing the process of consensus formation and operation — and one of the two most-common modes of their destruction (the other are instrumental revolutions). I also recommend Karl Popper’s work about the process of science, esp about replication and falsification. Certainly no need to apologize. Comments are a low-priority in life, except for the proprietor. And people subscribing to the thread appreciate follow-ups. There is much to respond to here. I will take it one step at a time. First,I do not believe I said anything at all about the Browning newsletter you cited. Please show me where I made such a statement. Second, when you refer to apologizing for “making stuff up” my guess is that you are referring to my statement: “Let us be frank: you are citing a very particular cadre of scientists . . . .” I implied that you cited exclusively or mostly to this particular group of scientists. You showed very plainly that was not correct. I do apologize for that misrepresentation. Looking back on our earlier exchange, I also see that my initial post implied that you were deliberately choosing your sources in an attempt to mislead or provide disinformation. I also apologize for that implication. Although I do have proper respect for Plato, I agree with your rejection of the noble lie, and I completely retract any implication of intentional deception. I am also posting this message on the original comment stream. That having been said, I disagree strongly with your representation of climate science to the layperson (as I am, and as I assume you are — that is to say, neither of us are professional scientists engaged in climate-related research, correct?). You state that: “While cheering for their faction of scientists, laypeople often lose sight of the big picture . . . .” I strongly agree with that statement. However, to whom does that statement apply? Neither of us is immune from ideology. Each of us has values to which we ascribe. We should, perhaps you would agree, direct our energies towards those values according to the best scientific information available. You said: “But the tone of your commentary is plainly supportive of the views of Spencer and his ‘faction. '” This post consists of quotations from only two sources: Browning and the monthly report by the U AL-Huntsville group. The Browning quote was the first and largest quote. I meant this statement: ““The scientists you quote most frequently are very much a particular ‘faction.’” You stated — you did not imply. It applies to you and your fellow alarmists. I — and many others — have written many times about the misrepresentation of science. I have quoted the IPCC and major climate agencies about matters clearly in the consensus of climate scientists. Alarmists reply with cries of “denialist”, and hate mail. I suspect the smearing of the FM website on the Web of Trust was by climate alarmists. So you’re “we are all at fault” is — again — you just making stuff up. Like most alarmists, it is your primary mode of debate. No evidence. You are flack in this important debate. 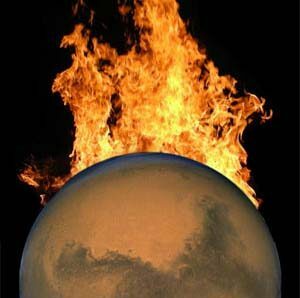 As far as I can ascertain from the IPCC reports and position statements of international scientific organizations, the scientific community as a whole considers rapid climate change caused by human beings burning fossil fuels to be a serious threat to a stable global civilization. Yes, there are a lot of value-laden words in that sentence. But when the AGU issues an official statement titled: “Human-induced climate change requires urgent action” laypersons must pause and think for a moment, musn’t they? These are logically similar statements, but convey vastly different implications. In the case of AGU’s statement, 14 professionals out 15 decided that the latter statement was a more accurate message to convey to the layman (you and I). You have chosen, as far as I can tell, to emphasize the former view. I wonder if, in any other area where science can inform our values, you would choose to emphasize the view of the one expert over 14 others? (1) You are (again) incorrect. The AGU did not say anything. There was no vote of its membership, or (if I recall correctly) even its Board. It was a committee writing a report. Given your record of errors, I think we should ask for evidence rather than accept your assertion. Also, you seem to believe that these paragraphs (both from longer statements) conflict, but do not state in what way. They look quite similar to me. Which brings us to Kuhn. The aspect of Thomas Kuhn you seem to be referring to is of questionable relevance in modern science. Not to say that science represents absolute truth. But science is not conducted in the same manner today as it was 500 years ago, or even 200 years ago. No one is going to overturn the relativity paradigm in the same way that Ptolemy was disproved. Ptolemy was wronger than Galileo and Copernicus. Moreover, we know this because of consensus. Consensus doesn’t necessarily mean that Roger Pielke, Sr., University of Colorado Boulder (dissent) has the wrong idea and Amy Clement, Rosenstiel School of Marine and Atmospheric Science, University of Miami (approve), John Farrington, Woods Hole Oceanographic Institute (approve), Susan Joy Hassol, Climate Communication (approve), Robert Hirsch, U.S. Geological Survey (approve), Peter Huybers, Harvard University (approve), Peter Lemke, Alfred Wegener Institute (approve), Gerald North, Texas A&M University (approve, panel chair), Michael Oppenheimer, Princeton University (approve), Ben Santer, Lawrence Livermore National Laboratory (approve), Gavin Schmidt, Goddard Institute for Space Studies, NASA (approve), Leonard A. Smith, London School of Economics (approve), Eric Sundquist, U.S. Geological Survey (approve), Pieter Tans, National Oceanic and Atmospheric Administration (approve) are all correct. But it makes one wonder. I have no idea what you are attempting to say. It reads like confused gibberish. Try citing an actual expert rather than making stuff up. Also — I cannot believe that anyone who has read Kuhn and Popper could write something like nnoxks — implying that a committee vote settles any significant issue in science. Anything is possible, but that requires a level of ignorance about the history and philosophy of science incomparable with reading at that level. It is the crude sort of appeal to authority of someone who has read about climate science in the newspapers and alarmist blogs — but knows little about even the basics. Given that nnoxks has written thousands of words with almost no specifics about climate — but lots of smears and criticisms — my guess is that this describes nnoxks. Is this intended as a rebuttal to Kuhn? Does nnoxks think that Kuhn believes that simplistic statement to be true? If he had read Kuhn –or anything about the history and process of science — bboxks would know that some aspects of science are the same, much has changed. I must also reply to the assertion that I have condemned Spencer for his personal beliefs, in a manner antithetical to science and akin to the inquisition. I do not believe this characterization is correct. You are not quoting from Spencer’s peer reviewed, published work. You link to his personal website. Then you assert that Spencer’s personal beliefs are not relevant to the information you provide. Those two facts are not consistent. Spencer’s personal website, to which you link, demonstrates that his statement of belief directly influences the information on his personal website. He provides a link: “Global Warming: Natural or Manmade?” Follow the link, and you will see the following statement: “This website describes evidence from my group’s government-funded research that suggests global warming is mostly natural, and that the climate system is quite insensitive to humanity’s greenhouse gas emissions and aerosol pollution.” This is in complete alignment with his religious beliefs regarding climate change, and is the same kind of incorrect implication I suggest that your commentary sometimes contains. Personal belief is entirely separable from good science (see Francis Collins). But when one’s science (a) coincides precisely with one’s religious beliefs and (b) is contrary to the opinion of the vast majority of other experts in one’s field, then one’s personal beliefs may certainly be relevant to a layman’s evaluation of the overall scientific evidence. Finally, I am compelled to say that Popper and falsification are not the final word in the philosophy of science. Everything you write shows your lack of understanding of science. Of course Popper and Kuhn are not “the last word”. I never said that they were. You’re making stuff up again. Like most alarmists, you cannot provide meaningful arguments – so you make stuff up and give rebuttals to it. I am rapidly losing interest. I did not “quote” from Spencer’s website. I gave a graph from it. Since he is a principal scientist on the team, I am confident he can accurately graph the data they produce. As for his beliefs, he is quite entitled to post about them on his personal website. Religious bigots like you can rail against them all you like. Like McCarthy did about the commies. Like the Catholic Church did about … many many people. I have given my opinion about your efforts to decide whose voices can be heard. Oh very well, I am losing interest as well. First, no, I made no “comment about Browning Newsletter” that could be interpreted as “another ignorant smear.” My statement that the tone of your commentary tends to support the views of a certain faction of climate scientists has nothing to do with the Browning newsletter. I think any reasonable reader will agree upon looking at my comment. Do you really find what I am trying to say about Kuhn incomprehensible? I am doubtful. Nevertheless, by raising the suggestion I should acquaint myself with Kuhn and Popper, you have plainly implied that my understanding of science does not account for uncertainty and shifts in scientific paradigms. Kuhn is often raised to emphasize (whether his work actually supports it or not) the uncertainty of science and unobtainability of absolute truth, which emphasis seems to coincide with your own. If you do not understand my claim when I say that modern science operates by consensus and that it is unlikely that relativity (or the main conclusions of the IPCC) will ever be overturned in the same way as Ptolemy was by Galileo and Copernicus, I don’t know what else to say. I expressly did NOT say that a committee vote settles anything in science. I don’t understand why you claim I say AGU’s and Pielke’s statements conflict. In fact, I say they are logically compatible, which is the opposite of conflicting. But they do convey different policy implications to the layperson. If you disagree I don’t know what else to say. I cannot sight peer reviewed literature to support my claim, but it nevertheless seems apparent to me. Finally, you construe my disagreement as “efforts to decide whose voices can be heard.” Nowhere have I suggested stifling speech. I have claimed that your analysis emphasizes the views of a particular faction of scientists who are not in agreement with the majority of experts in their field. And further, I have claimed that your analysis is sometimes flawed as a result, Kuhn notwithstanding. “cite” peer reviewed literature, is what I would do if I could. I recommended that you read Popper and Kuhn for the reason I stated — because it is obvious you have not the slightest understanding of how science works. I have cited specific statements by you as evidence, all of which you have ignored. There is no reason for you to make up a reason — let alone lie about what I believe. As usual you cite no supporting evidence. At what point are these malicious lies, not just honest mistakes? I never said or implied that I disagree. Again you make stuff up and give a rebuttal to it. Since I’ve said many times that I agree with the IPCC’s work, your comment is quite daft. Then what was the point of your comment about the AGU committee? Even listing the people on the Committee? It didn’t refer to anything I said in this post or thread. My initial response was that your comment was gibberish; my second was attempt to related it to your thread. I guess my first response was correct. You say that they have different policy implications — which makes them conflicting statements. You also fail to support your assertion, as usual. Here is what you said, a clear example of religious bigotry — implying that Spencer’s religious beliefs should be considered when evaluating his professional work . If you stated this as a supervisor about the work of an employee you would be guilty of religious discrimination. That’s actionable in some States (eg, California). (6) “I have claimed that your analysis emphasizes the views of a particular faction of scientists who are not in agreement with the majority of experts in their field. You admitted that your statement was wrong, and apologized. Now you repeat your lie. Charming. You have claimed a lot of things. You have supported none of them. The closest you came was your lie about the relative frequency with which I cite scientists. You have done no such thing. You stated: “History shows countless examples of consensus beliefs — often wide and deep (not all “consensus” are equivalent) that have proven wrong. I suggest you read a bit about the process of science. I recommend The structure of scientific revolutions by Thomas Kuhn . . . .” I replied: “No one is going to overturn the relativity paradigm in the same way that Ptolemy was disproved. Ptolemy was wronger than Galileo and Copernicus [a primary example used by Kuhn]. Moreover, we know this because of consensus.” You called this response “confused gibberish” but it looks to me like a fairly straightforward response to your comment. Your above quote about consensus beliefs historically being proven wrong, and subsequent recommendation of Kuhn, plainly implies that because past consensuses were wrong, the present consensus could also be wrong. Trivially true, but extremely unlikely. Such a statement serves no purpose but to cast unreasonable doubt on said consensus that temperature is increasing due mainly to anthropogenic emissions of greenhouse gases, and that if emissions continue to increase in the future, temperature will also increase. Just like (as we discussed much earlier) the statement “climate is always changing” is trivially true, but serves no purpose but to cast unreasonable doubt on the consensus that recent climate change is mainly anthropological in origin. This is already getting far too long. I still have four to go, but I do not think I will continue this for now. Perhaps later I will try to provide evidence supporting my assertion that you emphasize a particular point of view in your climate analysis that is not the view of the IPCC and other major organizations. That is a different claim, but the way, than the incorrect claim I made that you cite a particular faction scientists with greater frequency. But that is an enormous task and I am not sure I want to attempt it. In any case, it seems we are not going to find agreement. I will only add that I absolutely do think that a scientist’s statement of faith-based belief *about the specific subject he is studying* is relevant to a layperson examining critically the statements or the information that scientist presents in the context of his personal website. That is not religious discrimination, that is common sense. Like so much of what you say, this is too vague to have meaning. Probably because you have little understanding of these matters. (a) “because past consensuses were wrong” — No. Sometimes the consensus is wrong, which is why there are scientific revolutions. Sometimes they are correct. (b) Consensus about facts? Not likely to be wrong. (c) Consensus about specifics of climate science theory, such as the dynamics of the current generation general circulation models used for forecasting? Yes, these could be wrong in dozens of ways. I doubt any climate scientist disagrees, though they will about the odds. It’s not clear there is even a consensus on some of the issues involved (e.g., effects of clouds, aerosols, and especially solar cycles). Your statement about “consensus” in climate is irrelevant to this discussion (it’s a statement of the obvious). Both are examples of a classic troll trick: to state the obvious & undisputed as if it were a rebuttal. 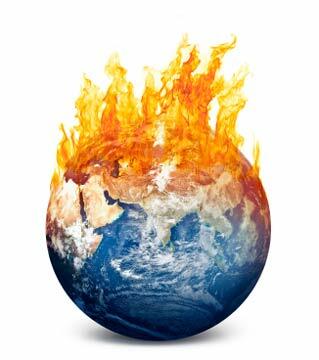 In effect, you might agree with the IPCC but the world is warming! So there! I reviewed these things at some length in section 5 of this post, and have repeatedly said so in this thread. Don’t hurry. You have not provided a single accurate logical rebuttal, have ignored my replies, and produced a large body of lies. Perhaps noble lies, like a true believer. Or perhaps you are a troll, a sociopath, or fool. It’s difficult to tell. This is a waste of time. I’m moderating your comments. Comments with actual information will be posted. Lies and troll-talk go directly to the trash. This is a trick you have used frequently. I do not like to label behavior as troll-like. It does not accomplish anything, so I prefer substantive replies. But these are wasted on trolls. And after sufficient repetitions there is nothing else to do but throw the “troll” flag and move on. It’s difficult to take this seriously when someone like Robert Spencer is referenced as a serious scientist on the matter, especially if this is done in order to present a pseudo balance to the “debate”, which I presume is the case here. 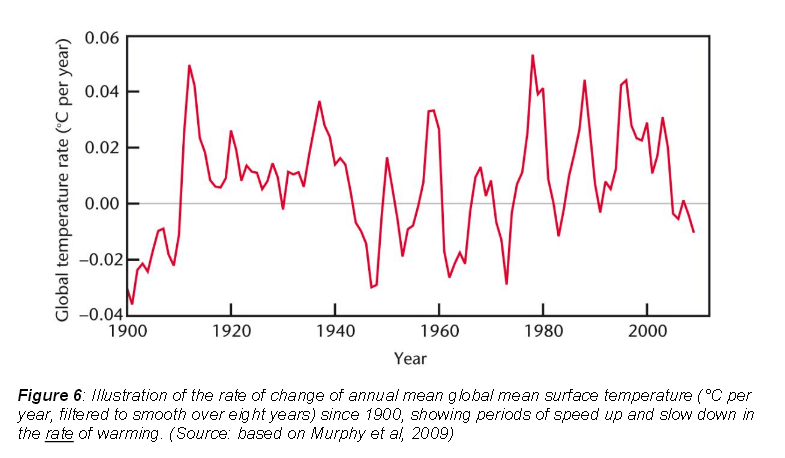 The Spencer graph only normalises temperatures on a 13-month basis, which may as well be raw data. If we are to see the genuine climate trends then that timeline needs to at least double in order to root out anomalies; Spencer himself doesn’t do this given his agenda, but others should be intelligent enough to figure this out on their own, not be silly enough to take it as serious science. If you do not like Spencer, write to NASA. It is their contract. Since I doubt you are a climate scientist, your opinion of Spencer is less than meaningless. As for your critique of the 13 month average, I assume this is the classic alarmist making stuff up mode of analysis. Use of 13 month running means is quite common in climate science. If you disagree, you can add that to your letter to NASA — since it is quite common in their reports. Report back to us about NASA’s reaction to your advice. Aeon reminds us of an important aspect of New America, how we are truly one people. That is, one people, thoroughly indoctrinated, under our leaders. The comments at general audience websites about climate — skeptic and non-skeptic (these are quite dumb labels) often have incisive and technically sophisticated notes. But the majority is tribal grunting. Our scientists good. Smart, brave. Their scientists evil and dumb. The names differ. Mann Spencer Jones Curry are good or bad depending on the tribe doing the grunts. After all, both sides are Americans. Of course the chorus is of people not qualified to correct the spelling in the papers of these scientists. Since this is America, there is another and worse dimension. These people, so far as I can tell, usually well-educated. Our national epitaph might be that we did not take Buckley’s advice and give the keys to the first hundred people in the telephone book. They might have done better. Everybody talks about the weather, but there’s not much we can do about it except make plans that take into account what mother nature may throw at us. For most of us that means planning for the next few days, but we should all be aware of climate patterns that are going to affect us for the next 20 to 30 years. And those patterns are changing not just because of global climate change but also due to long-term periodic changes in the Atlantic and Pacific oceans.